I have had a lovely few weeks at home, getting to grips with Heidi, giving Kvint and Emma a few easy days and lots of time in the field. I have been thrilled to bits with Heidi's progress. She has been a little star to hack out and is so easy to work in the school, and has made a very good start with her jumping. Since taking the video above she has jumped a few fillers, a little double and some scary planks - not blinking an eye at anything. She has now hacked the whole way round the village, taking on cars, vans and bicycles. I think she is nearly ready for a little training visit somewhere with a view to going to a training show once she is four. Bearing in mind that Kvint and Emma would have their next international show indoors we spent two days at the Oxford Area show at Addington. Kvint was very green indoors the first day, but willing and careful as always, and jumped very well in a strong 1.25 the second day. Emma jumped two 1.30's well with a minor placing on the second day. When it's all going well is the time to have some training to prevent it all going wrong. I just took Emma for a lesson with Shane before we set off to Le Mans. As always there was some useful tidying up of the rider, keeping my hands up and following Emma, rather than pulling with my dreadful left hand! We took the day boat from Portsmouth to Caen - what luxury! I had a horrible cold, but with a cabin to myself and six hours to kill I had a very restful, and unusual day reading my book. We arrived in Le Mans in the late afternoon and I got the horses sorted out very quickly in their lovely permanent stables. Having arrived on Wednesday meant that the horses could have a lovely quiet hack on Thursday morning and were well rested and loosened up for the trot-up on Thursday. My lovely friend Louise Alston, was the only other Brit at Le Mans, so provided we jumped different classes we were assured of being best Brit in every class even if we fell off! Emma got off to a good start on Friday morning with 7th place in the 1.30 speed class in the 2*. Kvint jumped a clear round in the 1.20 in the 1*. On Saturday my sister Polly, and my lovely niece Eliane came to watch and help. They were an invaluable help as somehow Emma's class ran early and Kvint's ran late so that poor Kvint had to go first in his class, but jumped well for just one fence down. Emma was jumping the 1.35 small grand prix and really should have jumped clear. 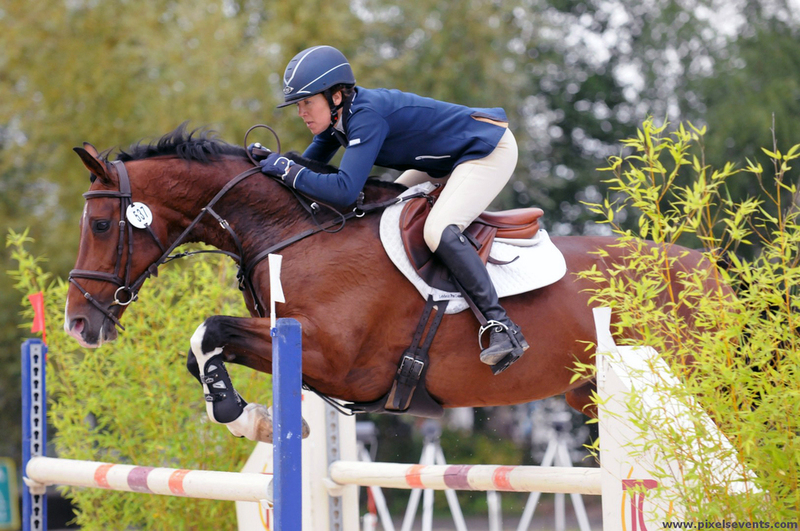 She had a really unlucky pole going into the combination, but still jumped well. On Sunday we jumped the 1.40 speed, which was huge, one pole to Emma and one to me, I think. She was a little bit surprised to jump two doubles in a row and I then let her jump far too big into the third double. Kvint jumped a lovely clear in the 1.25 to finish a lovely show. Le Mans is really the most beautiful showground with one of the biggest indoor schools in Europe, permanent restaurants, shops and stables. We then followed Louise back to Jemma Kirk's lovely yard at Le Pins near Deauville where we were lucky enough to spend a few days. This was just lovely. Louise and her husband Michael were so kind and helpful, Polly came and met us for lunch and took me to the supermarket, and not only did the horses get to go out in the field, but I also had a lovely time hacking round the beautiful countryside of Le Pins. One of the great things about driving huge distance at this time of the year is how beautiful all the trees are. I also had such lovely weather the whole time I was in France. On Thursday morning I left Le Pins rather reluctantly and trundled up to Dunkerque. Luckily a very friendly man on a moped directed me to the showground and I was there in very good time to get the horses bedded down and trotted up and give them both a ride. Emma was super sharp and flatly refused to go in the indoor warm up, so I had to hop off and lead her round, before hopping back on and convincing her that it was all safe! Dunkerque was overrun with British riders - not much chance of being best Brit with such competition as Guy Williams, Steven Franks and Rosie Moss in every class! However, Emma made a good start with 7th in the 1.30 speed in the 2* and Kvint jumped another clear round in the 1*. On day two Emma jumped really well in the 1.40, just being caught out by an upright by the gate and having a miscommunication at the last fence. Kvint had one fence down and with Shane's advice I decided not to jump either Grand Prix on Sunday. Kvint jumped a super clear to finish the show, and Emma just had an early fence in the Accumulator before jumping the joker beautifully. Dunkerque was a very different show to Le Mans. It is much more old fashioned, with a quite small school and a very small site. But the organisers were so helpful, and you have never seen a show with such a huge and enthusiastic audience. With an hysterical Ride and Drive on Friday night and a Puissance on Saturday the place was absolutely packed. At both shows the atmosphere, especially on Sunday, was electric. It's such a pity that the sport doesn't have such a following in England. It was a short drive back to Calais, and I was so lucky to get on a boat, as sailings had been cancelled for most of the weekend. We had rather exhalted company on the boat, with Carl Hester and Louise Bell's dressage horses returning from the CDI in Le Mans, Nick Gauntlett returning from Le Lion d'Angers, Adam Botham and Nicola Barry coming back from Lier and Dan Desart and myself on the way back from Dunkerque. I was home by 9.30 and everyone was in bed by 10.30. The end of a great trip! Monday morning was back to normal. Steph and Mark had kept everything beautifully organised while I was away. The horses had two days in the field. I have had a good catch up at work and we had a lovely dinner with Anna & Tom and Sophie & Alex in London. Heidi has been as good as gold to get back on and I have had some lovely teaching to do during the week. The next plan is to go to Rouen and Keysoe at the end of November and then see how the horses feel. Maybe we'll have a two month break while it's a bit cold for sleeping in the lorry, but who knows! On Tuesday, 20th August I packed up the lorry and Ferro, Emma and Biscuit and caught the ferry from Portsmouth to Caen for the CSI** at Auvers. Ferro for the Ladies' 1.30 classes, Biscuit for the Ladies' 1.20 classes and Emma for the 6 year old CSYH1*. Mark came with us in the car and we had a very easy trip over in a very comfortable cabin. Normally it takes just over an hour to the showground in Auvers, but if you take in a lengthy tour of Caen on the way it takes a bit longer! However, the horses were settled into their stables by 10.00 and there is a lovely hack along a disused railway line at the back of the showground, so they were all exercised, trotted up and declared for their classes in good time. My departure had been made a little more dramatic by the fact that Shane had a client for Ferro, the sale was agreed at 9.30 on Monday evening and she was vetted on Tuesday before we left, hopefully to be picked up in France, so even as I trotted her up I was not quite sure whether I would be riding her or not! Feeling a little uncertain I therefore decided to jump her in the 1.20 the first day, as I still didn't know whether the sale had gone through or not. Wednesday started with Emma in the six year olds, a very full-on 1.25 which was the biggest she had jumped. Although she started a little green she jumped double clear to be equal first and win a little bit of money. Biscuit & Ferro jumped very well in the 1.20 for four faults each. On Thursday Emma jumped in the main ring over a very spooky 1.30. Unfortunately she shied going to the first fence resulting in an enormous miss, but we collected ourselves up for a couple of poles, and a lot learnt. Ferro jumped fabulously in the 1.30 with one down in the jump-off which was definitely my fault, and Biscuit felt rather tired in the 1.20 for two down. On Friday the 6 year old Grand Prix was enormous, and Emma felt very green having two fences early in the course, but finishing really well. Biscuit was placed in the 1.20, and Ferro had a fence in the jump-off. Week one over - our first overseas winnings won, and all the horses went really well. One of the reasons for going to Auvers is that Polly, my sister, doesn't live far away. We had dinner with her and her friend Fi Thwaites on Wednesday and Friday nights, they came to watch on Saturday and then we spent the afternoon at her house near St Lo on Sunday once the horses had had a leisurely walk and graze. Mark went back to England on Monday and the show started again on Tuesday. Once again Emma was first up and to my surprise had two fences behind. I had used a stronger bit in the first week and felt that maybe it was overdoing it now, so I changed her back to her nathe Pelham for the rest of the week. Ferro jumped really well in the 1.30 and Biscuit jumped well in the 1.20. On Wednesday Emma felt a bit green again in the main ring with yet another strange water jump, Ferro was jumped a fabulous double clear and was really unlucky not to be placed, while Biscuit was also unlucky to find a Labrador in the middle of the last double in her class which may have contributed to her one fence down. Friday started with the six year old Grand Prix which once again was enormous. Emma jumped a fabulous clear in the first round and then again in the jump-off to be 5th. I was so proud of her - what an amazing little mare to do so well in really strong company. Unfortunately the six year olds ran late meaning that I missed jumping Ferro in the Ladies' Grand Prix, so she and Biscuit both jumped in the 1.20 final. They were both a little bit over-excited, but finished strongly and confidently. I had a lovely show, and felt that I was able to be competitive in fairly strong company. One of the bonuses of overseas shows is always meeting new people and turning familiar faces into friends. I was very grateful for the help and moral support I had from Tom and Jo O'Dwyer, and from Roger and Christine McCrea, and also a delicious supper and loads of fun from Jacqui Ray from Oakingham Stud. I had great fun travelling home with Rosie & Jane Moss, www.rosiemossequine.co.uk, and enjoyed getting to know Anna Beck, www.westonwarmbloods.co.uk. I also received a brilliant pair of socks from Jenny Cassan who is importing American riding socks, www.soxtrotuk.com. I was back at home by 9.00 on Friday, in time to break the washing machine and spend most of Saturday morning in the launderette in Uckfield. On to Hickstead this week and then either Barbizon CSI** near Paris or Bury Farm the following week.